Choosing a baby monitor can be mind boggling, not just in terms of choice but the price range. Throw in features that vary from audio kit to all–singing, all–dancing models with support apps and colour screens, and it’s enough to compound the all–encompassing sleep deprivation. The good news is that there are options available for every budget, from own brand options from high street staples to fancier kit from major brands. Follow our buyer’s guide to the best baby monitors and there’ll be no need to add to the stress of having to get ready for the impending arrival or do madcap research in the days after you first bring them home. When choosing the best baby monitor for you, there are a few things to consider. First off, you need to decide whether you want a video or audio-only monitor. 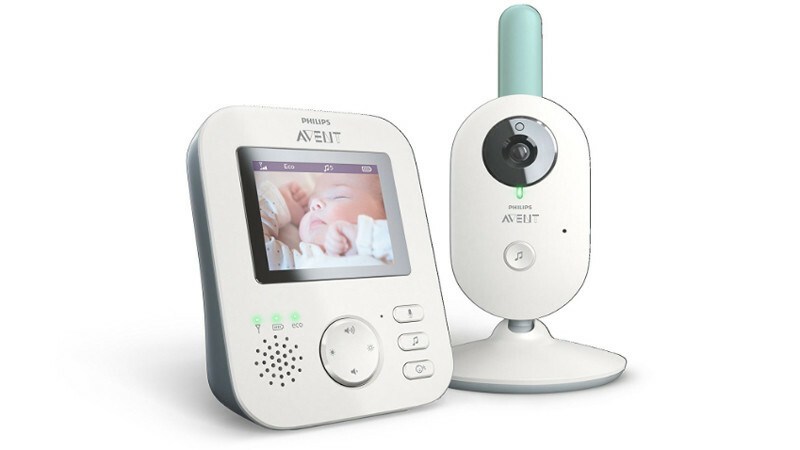 The best baby monitors allow you to keep both an eye and ear on baby, and for most situations, a video monitor is going to be best for absolute peace of mind. Audio-only does the job for smaller budgets though, or older children who don't need such a watchful eye (who are we kidding). To make sure the one you choose is fit for purpose, you should consider the video resolution of any video models, the battery life of the monitor, range, and features such as the ability to remotely adjust the monitor viewing angle if baby moves. Other features to look out for include two-way audio, cameras that play lullabies or white noise and those that have built-in thermometers. It’s also worth considering whether you would prefer a separate monitor (usually connected via long-range Bluetooth connection) or if an app on your phone or tablet will do instead. The latter is usually reliant on a solid, reliable wi-fi network, so do consider that before buying. Without further ado, let’s have a look at some of our favourites. 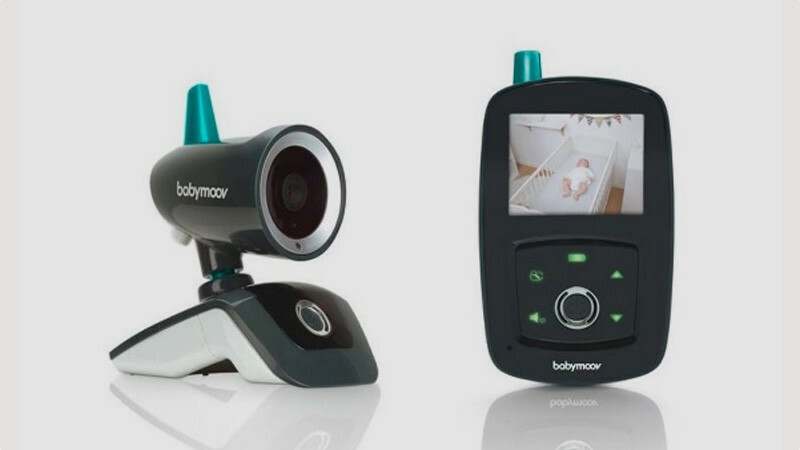 At the top–end of the scale, Spotcam’s Babysense HD makes use of cutting edge technology and has been developed with health professionals and security experts. 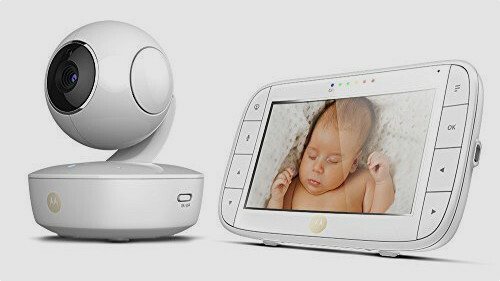 The 155-degree, ultra–wide-angle camera connects to any internet–enabled device, meaning you can see your baby on a smartphone, tablet or laptop screen. There’s no separate parent unit, meaning one less piece of kit to go missing once they’re asleep and you have a much–needed breather. Video is Full HD and, along with audio, can be recorded and saved on secure servers. Alerts can be set for changes in temperature and humidity and you can even connect it to Google Home or an Amazon Echo, asking those smart speakers to show you video whenever you’re concerned baby is disturbed. You can even share video with babysitters for the duration of their stay, with their access ending once they leave. With a sleek design that looks more like a high–end tech product than the usual bulky white plastic monitors on offer, Babymoov’s YOO–TRAVEL has won plaudits not only for its design but also for its features. The set works both wirelessly and plugged into mains power, with long battery life making it ideal for when you’re away on not close to a power socket. There’s a night light function so you can check on baby even after the lights have been dimmed, while a temperature indicator means you’ll be sure to know if their room is too warm or uncomfortably cold. 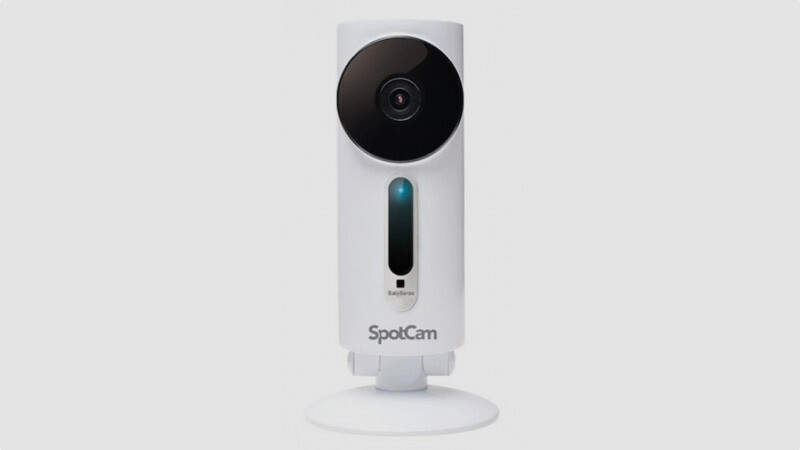 The camera offers 180 degree panoramic views and a voice activation mode makes it easy to use even when out of reach. Best of all, it comes with a lifetime guarantee, meaning it’s a winner for those with growing families. Motorola does one of the widest, most reliable range of baby monitors on the market, and the MBP50 is our pick of them all. It comes with a camera and large 5in Bluetooth colour screen monitor, offering a generous wireless range of 300 metres. Handy if you live in a mansion, but more useful for sneaking in a cuppa in the garden while your little one naps. Picture quality is clean and clear, and equally excellent when using the infrared night mode. For keeping an eye on wriggling kids, there's the ability to remote pan and tilt around 270 degrees, plus a 2x digital zoom for getting closer to the action. Other features include a thermometer, which we found to be about two degrees out compared with our nursery thermometer, sound-level meter, two-way audio for speaking to your baby and the ability to play lullabies to calm them from afar. Data encryption is integrated as standard so it's really secure against hackers, giving parents added peace of mind. The monitor comes with a 15-hour standby promise, but this is based on settings that see the monitor screen going blank after two minutes of inactivity. This can be adjusted to always on if you prefer, but it'll drain the monitor within a few hours instead. The headline feature of the BT Smart Baby Monitor may well be its smart integration, but we like it for its reliability and flexibility more. 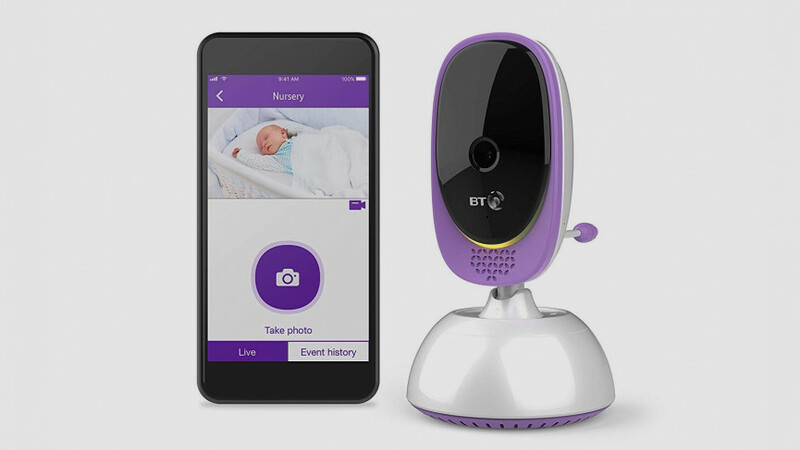 Taking the popular BT Video Baby Monitor 6000 and adding a few bells and whistles, the Smart Baby Monitor allows you to check in on your little one using the 5in HD parent unit (2.8in version also available) when in the house, or via wi-fi, using the BT Smart Controls app, when out and about. Picture quality on both is really crisp and clear, and night vision works well too. You can pan the camera around well over 180 degrees remotely (it’s a bit smoother using the parent unit than the app), but there’s not as much flexibility in its up and down motions. You can physically move it into place to get the angle you want though. The Alexa and Google Home integration is a nice touch, but it fairly limited for now. As it stands you can check the temperature (which, like a lot of monitors, reads warm), get it to turn off motion control or ask it to play a lullaby. There are five different lullabies built in, though considering the popularity of white noise toys, it’s a shame that some nature sounds weren’t thrown in as well. Range is around 250 metres, there’s really clear two-way talking and battery life is decent enough to see you through the night. Go for the app instead and you can have it ping you every time there is motion, though if you have a wriggly baby, you might find this is triggered a little too regularly. Philips has a wide range of baby monitors, but this is the pick of the bunch. The screen is large compared with other monitors, at 2.7–inches, and offers bright, colourful detail so you can get a clear view of the nursery at all times. Like its rivals, this has night mode for keeping an eye in the evening. It also comes with lullabies which can be played remotely, helping you to soothe your baby to sleep without disturbing them by going into their room if they’re only snuffling. Philips says it features a secure connection, meaning interference is kept to a minimum, while it also offers a handy 300 metre outdoor range so you can potter in the garden without the fear of not being able to see what’s going on inside. Although monitors with displays are now more commonplace, audio monitors are a perfectly decent alternative, especially if you’re on a tight budget. This simple model from BT does the job perfectly. It has an indoor range of 50 metres, meaning it will work in all but the largest of houses, with one unit to be left in baby’s room while the other can be carried around with you. 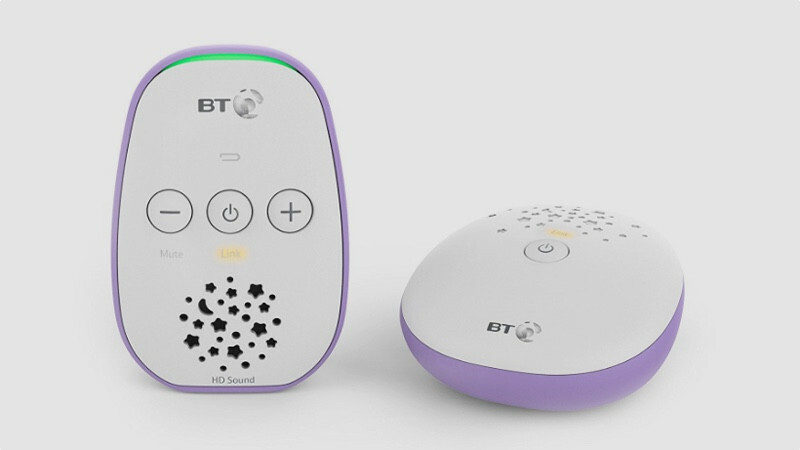 The audio it transmits is HD and interference free, meaning you’ll only ever hear the sound of your baby or whatever noise in their vicinity is causing them to wake. The parent unit features a sound level light, meaning you’ll soon be able to tell if your baby is simply snuffling or fully awake and crying. It might not have the option for you to see what’s happening, but this is a solid buy at a bargain price.